Scilab comes pre-loaded with a variety of functions to handle the Bessel and Modified Bessel Functions of First and Second Kind. Modified Bessel functions of the first kind (I sub alpha). Bessel functions of the first kind (J sub alpha). 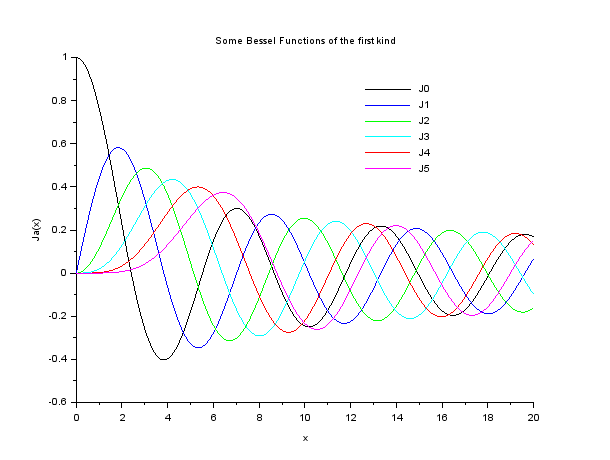 Modified Bessel functions of the second kind (K sub alpha). Bessel functions of the second kind (Y sub alpha). integer, with possible values 1 or 2, the Hankel function type. Now our objective is to plot the First 6 Bessel Functions of the First Kind. So I am going to use besselj(alpha,x) . The following code which is pretty much self-explanatory calculates and plots the First six Bessel Functions, that is J0(x), J1(x), J2(x),…,J5(x).